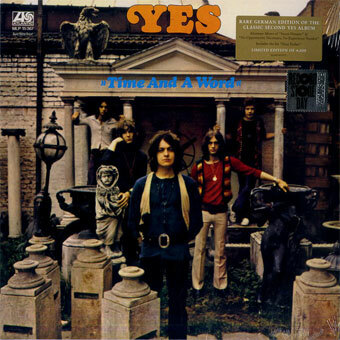 "Time and a Word" is the second studio album by the English rock band Yes, released in "July 1970 by Atlantic Records. It was put together several months after the release of their debut album Yes, during which the group continued to tour heavily and recorded Time and a Word during gaps between shows. Yes continued to follow their early musical direction of performing original material and cover versions of songs by pop, jazz, and folk artists. A small orchestra of brass and string session musicians was used on most of the album's songs. Guitarist Peter Banks did not support the idea of adding an orchestra to the album, resulting in increased tensions between himself and the rest of the group. During their UK tour in April 1970 and before the album's release, Banks was fired from Yes and was replaced by Steve Howe. The UK album cover was considered inappropriate for the American market, so a new photograph of the band was used, putting Howe on the cover of an album on which he did not appear. Official (Record Store Day) reissue.